Further to the analysis carried on by UNINETTUNO’s experts on the technologies and platforms being used by the partner Universities, we were able to see that each University chose dissimilar platforms. Most of the university partners chose Moodle, other ones opted for more commercial platforms such as Blackboard, whereas other ones realized a platform of their own by themselves. After having learnt about this situation, we built a learning model which is consistent with the specificities of the project which includes traditional Universities wishing to realize distance teaching courses as well. Therefore, this model is a blended one and can be applied, in technological terms, to all the platforms selected by the partners. In this document we are presenting the general outlines of the model, regardless of the platform being used. In order to present a concrete case of application of the model within a specific platform, you will find a further document, where we presented the actual implementation of a blended learning model by means of the Moodle platform. The realization of this blended teaching and learning model is dependent on the development of the various components. More specifically, the blended learning model is characterized by the fact that some training activities take place on the face-to-face mode, whereas other ones on the distance mode. 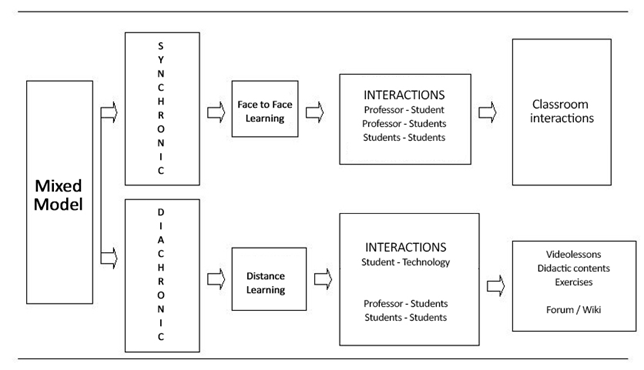 The proposed model is a blended model (see note 1 and picture 1) in which some teaching activities take place on the face-to-face model, whereas other ones on the distance model. The proposed model entails activities for which the student works only on the Internet and activities that allow him to interact with teacher and students on the face-to-face mode. Propose more-in-depth study lessons related to the problems noticed during the learning process. The diachronic learning modes, instead, take place at distance, on the Internet, and, more specifically, on the partner Universities’ e-learning platforms. These mode envisages the self-study of the student, who accesses the educational material by interacting with the set-up technological devices as well as teacher-students and students-students interactive sessions. The proposed models entails an evolution of the teacher’s role. Actually, teachers have to learn to deliver their courses through videolessons, to design multimedia products, online exercises and training materials to be posted on their own e-learning platform and to guide the students along their self-learning process, following non-traditional methods and technologies. The teacher performs a double function of teaching by means of his videolessons, but, at the same time, support learning using the Internet. The first aspect to be considered while realizing an e-learning platform of one’s own is the customization of the interface that will guide the students in accessing the educational materials and tools. The navigation interface that will be designed is an essential element of the student’s learning experience; in particular, when we build an interface we have to conceive it for an online learning environment having training and educational aims and, consequently it is necessary that this interface has specific features that distinguish it from the typical interfaces of the Websites designed for commercial or entertaining purposes. The portal’s interface must be designed in such a way as to offer the student a simple, clear and intuitive working environment and it will be aimed at building a learning facilitating device. Actually, the interface represents the access point to the learning path and the metaphor on which the homepage represents the access point to the world of knowledge, representing the various environments through which the learning process will take place. During implementation phase, cognitive models for the interfaces realization will have to be applied. In particular, the interface of the learning portal will appear as set of graphical components built in such a way as to facilitate the student to have immediate idea of the underlying conceptual model and to promote the understanding the different learning opportunities and to avoid a sort of random exploration that could be useless for the attainment of the proposed objective. Freedom of navigation and choice will be mediated by indications connected with strategies that will lead the student to follow a logical consultation path, and to encourage him to study more in depth some sections. Actually, by structuring the learning platform and its interface we aim at combining student’s freedom and independence in choosing his own path and his learning pace with the active and guided support of the teacher (in this case “face-to-face”) which he can consult at any time. Consistency between environments, in the use of terms, colors, fonts and layout. A complete and coherent contents presentation. In technical terms, the platforms available at the Partner Universities give the possibility of uploading various types of multimedia materials. This chapter illustrates the types and features of the multimedia educational materials that the teacher of the Partner Universities are trained to realize: videolessons, slides, texts, bibliographical references, Web-based resources, interactive exercises. In the videolessons, the video teacher, beside transferring knowledge on a given subject, leads the student towards a study and learning method, towards a critical reading of the exams texts; therefore, the video teacher shows characters that resemble those of the traditional classroom-based teacher: he asks them to take notes, proposes exercises, promotes self-assessment asking questions and raising issues. simplify complex and abstract concepts by displaying concrete examples, simulations and experiments, models of behavior. using anticipated or propedeutical organising concepts allowing to foster the student’s cognitive matrix by highlighting key concepts to which the teaching material can be linked and by supplying a framework of conceptual references to support of the whole teaching process. A useful support, that the teacher can use during the videolessons, is represented by the slides realized with appropriate graphical software programs. One of the main advantages of using slides (that can present simple writings or charts, tables, diagrams etc…) consists in the possibility of enhancing the student’s attention. Taking into account the fact that attention is mainly related to individuals’ motivation, we can affirm that the introduction of a visual channel in communication can enhance the possibility of enhancing the viewer’s attention. Attention often fails if the presentation becomes boring and in this sense the use of slide can enhance it since it introduces a “change in style” which represents an element of novelty. An appropriate use of a graphical presentation helps the students since it acts as an external memory. Nevertheless, it is also possible to make an inappropriate use of the graphical material: often, actually, slides include the presentation and reading of long and complicated texts and key words that are unclear and not concise that are not useful to summarize and pinpoint basic concepts and that is the reason why it becomes difficult to access information and process its further. An important element for enhancing the comprehension and memorization of the concepts expressed by the teacher can be represented by graphical animations, videos or films visually displaying the theoretical issues being developed as well as the practical applications of formulas and concepts being communicated. Every theoretical concept can have a visually and three-dimensionally animated representation. The appropriateness of the representation is strictly linked to the task and to the aim that is set. Colors must be chosen carefully. The background must be homogeneous and it is recommended to use different colors in the same page in order to highlight the different issues. However, you have to pay particular attention on how you match the graphical composition colors with the background; you must not use the following ones: red and black-and-white matching. You can use: blue, green, black, yellow in all their shades. Preamble: In the videolessons the teacher should not only transfer knowledge on a given issue, but he must guide the student toward a study and learning method and to a critical reading of the exam texts in order to trigger learning processes and facilitate their assessments. During the first videolesson, the teacher introduces himself to the virtual student by adopting a familiar communication style to arise a guided didactic conversation, a simulated two-way communication. The teacher, by addressing him personally, involves the student in an emotional way and makes him play an active role in the learning-teaching process. By introducing “himself” and using personal pronouns, the teacher becomes familiar to student and further stimulates his active participation. The student’s active participation must be enhanced by alternatively adopting both more formal academic languages and languages that are most suited to a more colloquial and informal communication. Beside using personal pronouns, the professor has to pay attention to the rhythm and tone of his voice: a too much low tone of the voice may jeopardize the success of his contribution which may be equally jeopardized if his tone is too high or his rhythm is too fast. The professor addresses himself directly to the virtual student and involves him personally by suggesting him the best way to follow the lessons: have pen and paper or a tablet and a PC to take notes, print the slides or put them in special file on his PC to write some notes beside them. The slides can be a cognitive support to facilitate the comprehension of the issues treated in videolessons and in the text books during the study activities. Presentation of the course subjec: the teacher raises some questions or general problems, which make realize the value of getting to know the contents of this subject paying particular attention to these same ones in specific real-world situations. The teacher shows the course essential requirements, lists them and reads them to help the students understand whether their basic skills are adequate to follow these contents. In the second slide, the teacher shows the course objectives and the issues that will be treated in the videolessons. These objectives are also given in operational terms. The teacher explains the course inner logic and any possible difficulties that the student might encounter and suggests study strategies in order to face the issues related to the subject. The professor presents the textbook referring to all the videolessons issues and educational tools to be used during the course (books, articles, software or Internet-based exercises, etc.). In order to shift to the issue of the individual lesson, the teacher illustrates the lesson objectives in operational terms and suggests the strategies helping the student to understand the lessons. The teacher raises some questions or problems defining the content of the lesson as answer to these questions and, by a slide listing all the previously treated issues whose knowledge is a precondition to the understanding of the following issue. Using a slide, the professor presents a structured table of all the issues that will be treated in that individual videolesson. At the end of each issue there is a slide summarizing the treated contents and other slides present some questions referring to the previously treated issues. The student is invited to answer these questions in expressly created area of the platform, which is called the Didactic Cyberspace where, through interactive exercises, the student will enter the answers to the questions or correct the exercises getting the related assessments which can be consulted by each student. At the end of each issue, in order to highlight the shift to a new issue, a slide is displayed that is read by the professor and that recalls the title of the issue treated, the final summary and the key words related to the issue and proposes to the student some questions related to the treated issue. The questions the teacher asks at the end of each treated issue and at the end of each lesson become tools that facilitate the students in selecting the issues requiring a specific further study and allow to assess their comprehension level. Three minutes before ending the video recording (which will be indicated by the cameraman), the teacher summarises the treated issues (by reading a slide) and indicates the references to the textbook and to further multimedia educational materials available in the Didactic Cyberspace related to that specific course. The use of a tools such as the videolessons changes the traditional teaching communication: teachers have to learn a new way of explaining, summarizing and presenting their own knowledge to a virtual student in order to be able to trigger a critical and analytical learning process. Videolessons require a specific preparation work and, in other to exploit the potentials of this tool, the teacher has to work with a team including technicians and experts in the image language. We established that each hour of videolesson requires from twenty to thirty hours of preparation work. This, naturally, develops in the teachers new communication skills and the use of new languages also to memorize the results of one’s own research team. This new teaching experience has an impact on the way they deliver also in their traditional academic courses. Beside the videolessons, the teacher has to supply the students with more-in-depth study educational material as regards the issues being dealt with; to this end, the teachers are trained to realize new models of books, multimedia software packages, virtual laboratories linked to the videolessons. These multimedia products are built in such a way as to include the basic notions of the various disciplinary sectors, methodologies of interactive transmission, models of processing of self-learning, self-learning systems. These materials can be of different types: digitized books, papers, essays, electronic more-in-depth sheets as well as not merely textual material such as photo galleries, presentations, video clips, selected bibliographical references or Web-based resources relevant to the treated issues and, finally, interactive exercises. The teacher will have to search for, collect and make available to the students this kind of materials, sorted by topic, in order to allow the students to be able to access this material while keeping their control over their own learning path (deciding, for instance, what to study more in depth and when), but allow the students to follow their own learning paths being guided by the organization of the educational material prepared by the expert teacher. Therefore, the educational material will have to be selected and produced in order to be effectively relevant to the issues treated in the videolessons and to the topics illustrated by the teacher in each one of the videolesson produced. The more-in-depth study educational materials in text format (essays, papers, book chapters etc.) and the multimedia ones (photo galleries, presentations, videos) will allow the students to deepen the single issues treated by the teacher during the videolessons. Speaking about texts we mean all the material that the teacher can directly supply to the students in textual electronic format: essays, papers, more-in-depth sheets, book chapters etc. This material can be retrieved by the teacher already in electronic format and be available on the Internet or on paper-format and therefore to be acquired in electronic format. In the former case it is advisable to prefer materials that can be downloaded for free; in the latter case it is obviously necessary to request to the publishers and/or authors the necessary permits and therefore digitize them according to the rule on copyright and of contents delivery at academic level of one’s own country of origin. The recommended format for downloading the textual format materials is on PDF: it is a format compatible on all mobile devices and on all desktop operational systems. Beside the textual format material directly available on one’s own learning platform, the teacher may suggest to his students other more-in-depth study paths that will include resources external to the platform. The teacher may select bibliographical references suggesting to the students the texts that deepen each one of the issues treated in his videolessons. This proposal of more-in-depth study texts can be commented by the teacher who will explain the students which aspects are deepened in each one of the texts also indicating how they can find the recommended work (if available in online libraries, of available in university or public libraries) and specific chapters to refer to. and any practical procedure that the student has to follow to access that section of the website indicated as the most relevant for his study. This category includes all educational materials selected and realized by the teacher that are not merely on textual format: other videos related to the videolessons issues, slideshows, presentations, simulations and case studies. Based on their format, it will be possible to directly download the materials or rely on the embedding of materials coming from external websites (Slideshare, YouTube, etc.). It is advisable to always quote the source of all materials. In order to complete all the types of materials that each lesson should offer to the student, we have to mention the interactive exercises. This kind of material is aimed at allowing the students to check or, in the more appropriate realizations, to put into practice the theoretical knowledge acquired through other multimedia educational materials that were made available. The exercises are materials that are specifically realized by the teachers or aimed at checking, by means of tests or self-assessment paths the notions and skills actually acquired by the learners by using the contents of the videolessons and of the related educational materials. The teachers should create an interactive exercise associated to each one of the issues treated by the videolessons. This allows the students to receive an immediate feedback on the acquired skills and on the learning progress for each one of the issues developed by the teacher. Additionally, the teachers will be able to prepare exercises that can be delivered and that will need their direct intervention in correcting and assessing them. These exercises can be delivered should be wider (namely related not only to a single videolesson) and ask the students to put into practice the learnt theoretical knowledge in real cases. planning face-to-face meetings aimed at filling any learning gaps found checking the results obtained by the class on their exercises. The platforms available at the Partner Universities do not supply advanced systems for teachers-students synchronic interactions by default. However, they can propose discussions and collaborative activities by means of Forums and Wikis. The face-to-face teaching activities of the blended model will allow the Partner Universities and their respective teachers to overcome this limit of their platforms. The teaching use of a tool such as the forum is controlled through the teacher’s direction and guide. The teacher has to propose a new discussion about each one of the issues treated in the videolessons, suggesting one o more reference essays and articles dealing with the proposed topics acting as theoretical basis for the students’ more-in-depth studies. Thanks to the forum the students handle and exchange information by writing, actively building their own knowledge. In addition, they also develop reasoning, critical and synthesis; the use of a communication medium that is based on writing compels them to organize their own ideas in a well-reasoned way, to communicate them clearly, to defend their opinions and to criticize – in a constructive way, those of the others. By using the forum, which is an asynchronous and permanent tool, contents can be retrieved and reusable further on, by the students who produced it as well as by the new students interested in investigating these same study issues; the material produced by the students and posted in the forum forms some kind of database of the course subjects that can be used and enriched by the students in further courses delivery periods. The term Wiki is generally meant as those websites – or those areas of a Web-based portal – where each user can modify all pages and create new ones by a simplified system of textual contents entering and modification which requires a high-level basic computer skills. The Wikis usually offer a versioning system (that shows which students modified which paragraphs and which pages and allow to restore the previous version of the pages in case of serious mistakes) and a small internal search engine. Unlike the Forums, largely meant to animate discussion among students under the supervision of the teacher, the Wiki is not a discussion tool, but a means for joint contents handling. In a teaching activities framework, the Wiki allows to plan and propose cooperative writing experiences to the students. The students, being guided by the teacher, can create a Wiki of their course proposing, for example a dictionary of the technical lexicon for a specific course. In a teaching activities framework, one of the Wiki’s more effective applications is certainly represented by the creative writing experiences or by team-based research work; in these cases, the students are guided by the teacher in performing a task that, based on the course scientific specificities, can vary: drafting a scientific research work related to the course issues, writing a creative text, drafting a contract, a deed, a marketing plan or business plan, etc.). This kind of activity allows the student to use the skills acquired in the course in an actual context and to do so in cooperative way with their own classmates. Garito., M.A., Anceschi, Botta, M., 2006, “L’Ambiente dell’Apprendimento” – Web Design e Processi Cognitivi, McGraw-Hill, Milano. Garito, M.A., 1997, The Role of Television in Teaching and Learning Processes, in Multimedia and Distance Learning for Science and Technology, Garamond, Roma: 239-272. The blended psycho-pedagogic model was designed by Prof. Maria Amata Garito in 1996 in order to apply it to the teaching and learning model of Consorzio NETTUNO through its first Internet-based platform. This model is under copyright and it was published in the volume Garito M.A. “La Multimedialità nell’insegnamento a distanza”, Garamond Ed., Roma, 1996. The Format for realizing the videolessons takes origin from the results of the strategic research project of CNR (Italian Council of Research): "Comunicazione Didattica Multimediale e Insegnamento a Distanza (Multimedia Didactic Communication and Distance Teaching)", and more specifically from the operational unit: "Elaborazione di modelli televisivi di insegnamento universitario a distanza anche attraverso l'uso di reti telematiche ed informatiche (Elaboration of the television distance university teaching models using satellite, telematic and computer networks), (ISDN and INTERNET)" led by Prof. Maria Amata Garito. The experiences made in various scientific university contexts and carried on in the last 25 years both at Consorzio NETTUNO and at UNINETTUNO allowed to identify new languages and new methods to be used to communicate on video scientific knowledge aimed at developing critical learning processes. In particular, thanks to this study we identified the language that has to be used to allow the student-user to exploit the learning strategies that the students implements while displaying the digitized videolessons. This model, further developed, was deposited and registered by Prof. Maria Amata Garito as Format for Realizing the Videolessons – Video Communication Model (SIAE Deposit Nr. 2017001505 as of 27/04/2017) and is under copyright. This project has been funded with support from the European Commission. This publication (communication) reflects only the author and the Commission is not responsible for any use that may be made of the information contained therein.